Vance is a weird kid. He’s always been a weird kid, ever since he moved with his (even weirder) mother to this small town and bought a big glass house in the middle of the woods. He was in high school then, he’s in college now. He has one friend, a girl named Donovan. And quite a bit of the time he has no idea who he is. Yeah, Vance is a weird kid. He wasn’t always quite this weird – the amnesia thing started a couple of years ago and pushed him over the edge from mysterious newcomer to bonafide oddity. Now when he loses himself Donovan is there to fill him in on his particulars – name, schedule, home, until they start to slowly come back to him. The strange thing is that he seems to be doing this to himself. But how – and why? The Forest’s Son is Vance’s story. But it isn’t just the story of this boy; it’s also the story of a lost culture, the dangers of breaking the rules, and what happens when worlds kept carefully apart for generations are forced onto a collision course. It’s also a sappy teen romance. If you’re absolutely allergic to those, stop now and find something else – but that would be sad because you’d miss all the other goodies. We follow Vance as he uncovers the mysteries that lead not only to his intermittent amnesia, but the answers to his less than average upbringing and origins. We travel to Poland and back, commune with nature and get to imagine for a while that sometimes legend is more than just old stories. 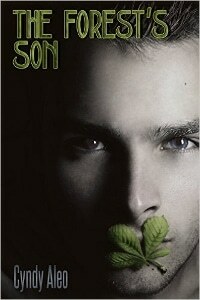 I really like the premise of The Forest’s Son. It’s filled with magic, superstition, prejudice and fear. It’s pretty cool to be able to find all of those things in what amounts to swoony teen fiction on the surface. Author Cyndy Aleo manages to put her teenage protagonists in the middle of situations that call not only for bravery (something Donovan could, honestly, use a bit more of) but also understanding and a great deal of tact and compromise from both teens and the adults with whom they conflict. I like Vance as a main character, and to a lesser extent Donovan as his female counterpart, but I was fascinated by his mother and her family. The layers of complexity Aleo gives to the society in which she lived until the birth of Vance lends the book a level of maturity that’s almost always missing from fiction where horny teens have more than a peripheral role. As her life comes full circle, we witness firsthand how completely she was transformed by the arrival of her child, and how foreign she has become to those she left behind. It was the part of the story that spoke to me (of course, since I’m a mother rather than a horny teenager) most loudly, with themes and undercurrents that I suspect more than a few mothers will appreciate. Overall, The Forest’s Son is a well written, well-paced, nicely layered story of a boy who is more than just a boy. I also enjoyed Aleo’s first novel, Undying, and this is a worthy successor. Unless you can’t stand the notion of some teen romance, give it a shot.